The WF20 fully automatic case former introduces a new level of refinement and performance and raises the standards for ease of use, case forming quality, and customer value. Technical Packaging Systems is inviting anyone interested in seeing this case former in action to our facility to experience hands on testing. Our Automation Summit will run from August 29 to September 16. To sign up and reserve your time slot click here. Not only will you be able to experience the WF20 but you will also be able to see and test all of the packaging materials on our show floor. What Makes the WF20 so Great? 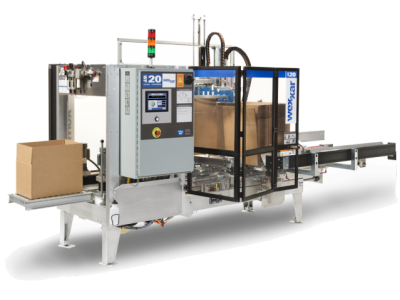 The WF20 features a case squaring system and Pin & Dome case opening system that together ensure accurate forming throughout the process and easy handling of common imperfections found in corrugated boxes that can impact efficiency and quality. Built for sustained high speed tape applications, this operator friendly machine will handle your most demanding packaging needs. Vacuum-free case opening is accomplished using the "Pin and Dome" technology. Each case is mechanically captured and positively squared with precision and reliability unmatched by any other system. The Flex Speed feature optimizes your machine functions and meets the needs of each case size by providing speed ranges that the operator can quickly access and select. Tool-less, color-coded, pictorial instructions facilitate case size changeover in approximately 7 minutes (bi-lingual option available). The WF20 offers advanced fully interlocked safety guarding for easy access service. The tilt-out tape head gives the user a quick, easy tape roll changes (on tape version). If you're looking to see all of these features in person, make sure to head on over to our facility and see what you've been missing.